Nowadays an iPhone with 64GB is not enough. Especially iPhone X. But we don't have cheaper memory storage for iPhone X. There are only two options available for X. If you want to know the other iPhone model upgrade price list. The owner kept it many years until now found a true specialist to recover the data. When the logic board bent like this, I'm sure the iPhone won't able to turn on. In condition bent like that, most technician would tell you that the motherboard is spoiled. The board might be spoiled. But the memory chip not broken, right? 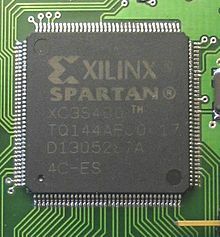 As long I see the three important IC is not broken then I can still save the memory data... or even fully repaired it. Let's me explain some details. 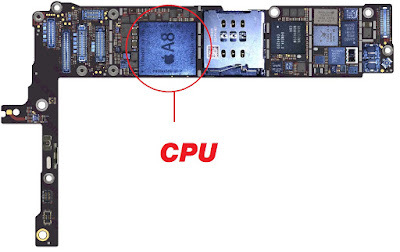 In the current era, all iPhone IC chipset (integrated circuit) are using BGA (Ball grid array). They are bound on the board with solder balls. Not this type anymore. So that your iPhone can be designed smaller. 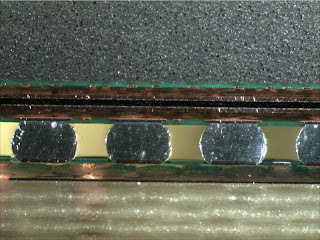 The photo above is a macro shot at beside of a BGA IC that bound on the motherboard. Those are solder balls joint. So in closer look... those IC failures because of crack. So now you understand why I said it still can be repaired. As long as I see a few "important" IC are not broken yet. I need to inspect those parts by microscope and let you know the chance of success repaired. Your processor is also known as CPU. Without it, your data is unable to decrypt. Do you know there is news that the FBI is also unable to hack or bypass the passcode of suspect's iPhone. They even ask Apple to unlock it but they decline and said it's not possible. It's against their policy and product design. When I see these 3 parts are good condition. All I need to do is just transplant them into a good motherboard. So I just moved this 3 parts into a working motherboard, it should able to turn on. After a few hours of surgical works. Done! All data remain the same as before accident happened. The hardest part always is the CPU. Not many people in Malaysia can do it. Having the equipment to repair, doesn't mean having the skill. Reball CPU is very complicated works. Choose a technician to carry this job is just like choosing a doctor to open your brain or heart. Microscope photo shot that I repaired this iPhone. 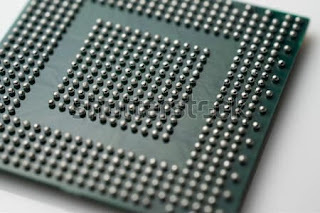 If you see those balls in your iPhone CPU, means it's been repaired before. 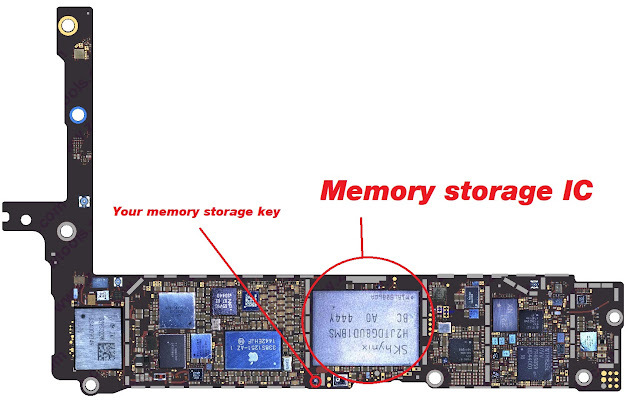 iPhone that no repair before is unable to see those BGA joints because Apple Black Glue sealed around it. Someday I might write what procedures to repair the CPU. It is too many steps which normal technician couldn't do or no waste time to train on this. They don't know what heat that won't harm the CPU. They don't know how to remove CPU safely and not breaking its point. They don't know how to rebuild the SDRAM because it sits on top of the CPU. They don't know how to perfectly reball CPU hundreds of balls with balance same size. ... a lot more they don't know. Master the heat of their machine. Master their blade so it won't damage the CPU in the removal process. Master the massive reball skill. We repaired so many iPhone 7 and iPhone 7 Plus that having No Service problem. If you try to restore it, you will end up like this. Unable to activate the iPhone. Click the "!" exclamation mark at the bottom right. You can see there is only Serial Number and No IMEI. Then it's confirmed you have a hardware problem. The same iPhone above is repaired. A normal working iPhone would be like this. MEID, SN, and IMEI. Because Apple needs to verify is the device Serial Number and IMEI number match with their server or not. Server won't let you activate if S/N or IMEI missing or not match with their list. It is a motherboard issue that one of chipset called Baseband is not working. Why baseband is not working? Baseband power circuit shorted due to water damaged. 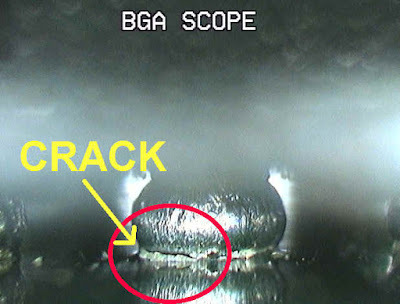 Solder joint broken caused by heavy drop but the problem won't occur immediately, usually happen later. 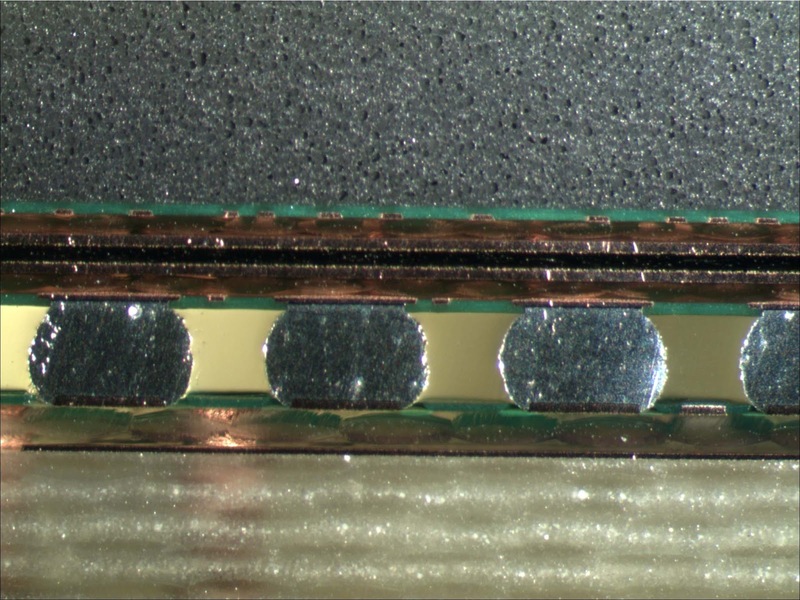 The red circle is Baseband ic. To repair this, the technician must be very well trained. If not, it will kill the A10 CPU on beside due overheat causing unable to power on. 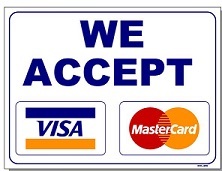 Solution and price?Sorry, we must need to open up and check before repair or quote you a price. Because it can be many reasons causing baseband failure. Some just need reball and rebuild the broken tracks/pads. Some are shorted BB PMU (baseband power ic) or components around it. Some are because some shop attempted to repair another problem but created this problem. We need to repair their mess. So the price varies. We need to check first. Last year i wrote an article about this repair. Almost every day we repaired iPhone 7 audio ic issue. We called it "Audio IC disease"
Sometimes a few different customers come in to repair the same issue at the same time. Don't worry, we still can fix it within 2 to 4 hours. This is a very common sound problem for iPhone 7 or iPhone 7 Plus. Headphone and Bluetooth mic are not working too. Three iPhone 7 Audio IC repaired at the same hour. How to repair this? i wrote an article and video for it here. Always send to a real professional for repair this issue. "Having the tools to repair doesn't mean having precise surgical skill and experience." Send to the wrong shop you will end up having more problem in your iPhone. I saw a lot of customers ended with the problem of "no service". I repaired the mess they created at a higher cost. Some even shorted the CPU and the iPhone unable to power on. It is very dangerous by just watching YouTube try to fix it without properly trained. But not valid if the board been "repaired" by others. and also not for water damaged. Click here BOOK appointment to repair this problem in a few hours! Chinese new year we will be closed on 3 PM of 4th Feb 2019. Reopen on 11th Feb 2019 and resume usual business hours 10:30 AM - 9 PM. Today topic is episode 2 of "High Capacity battery" review. This one some of you might heard the name. I'm going to install it in an iPhone 7. The size of battery is totally same as original. It makes me wonder again. To be fair, i conducted the test with few rules. Restore the iPhone and latest iOS 12.1.2. No any third party app installed. Clean. Empty the power and charged back. 3 Cycled. Run multiple test in the same temperature room. Final step, USB adapter voltage check to see how many mAH this battery absorbed from charger at 1% into 100% full. No SIM and NO connect to WIFI. Running offline benchmark app and offline videos to see how it goes down in 3 hours. Of course the iPhone must be in very good condition. No issue and fully original parts. No repair before, except battery changing. As usual, i'll use PC app to read it. This company of battery really did their job to program the chip for capacity reading. Let's see is it true as the system show us. Unlike the "previous battery" review which don't even show more actual capacity than design capacity. Actual capacity is important. What's the point of high capacity battery doesn't show more mAh than the original capacity? At the same time i'm typing this, another brand of high capacity battery company contacted me. They are willing to give me some of their product to run the test. So there will be one more brand to test. 1st day, the battery is really better. Noticeable. about 15%. 3rd day, 20th Jan 2019. The battery now should be at the best condition. But it's decreasing as the other so called high capacity battery. Now in every test it just last about 10%% longer. I need to extend to test to one week. Original doesn't decrease capacity so fast. Decreasing it's capacity so fast. 84 mAH is gone. To be fair, one charged cycle should just minus around 1 mAh. Honestly to tell you, i'm not surprised but disappointed. Thanks the battery sponsor, they are willing to wait for more test result. Update for 26th Jan: Battery is good but actual capacity dropped more again. Original battery decrease actual capacity slower than this third party battery after each cycle charged. Conclusion: It is really extended usage of time. But only 10% around. And the 10% extra would just last for 2 months and it would be the same or might lower than original. Countless times i told the customer there is no such of high capacity battery. A customer came in to replace an iPhone 6 Battery. He replaced it with a so-called higher capacity than the original battery that should be last 20% longer from one of Apple Repair Specialist. But he still thinks it's battery problem which his iPhone 6 drain too fast. Need charge twice a day. However, it's not the battery issue which we already repaired his motherboard problem. As you can see, it's written 2100 mAH. 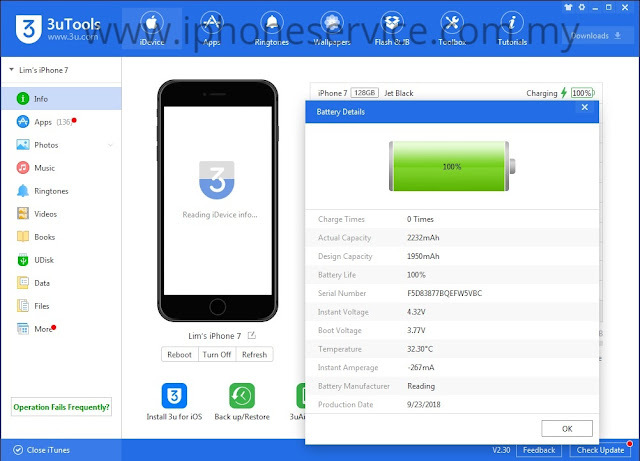 iPhone 6 Original Battery design capacity is 1810 mAH. Apple is really provided best battery for its own product. They already maxed out the capacity and space that allow the battery to fit in. Apple product is not cheap, you know? The only way to find out its condition is NOT in iOS health or Battery Life app. We must use PC program to read it! Use pc to see battery report. The photo below is using iTool (Chinese version). This program also allows us to transfer photo, backup data, set ringtone and songs without using stupid iTunes. 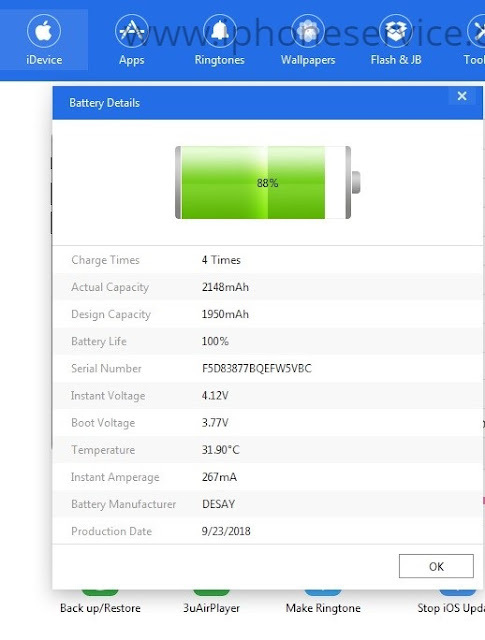 We found out his battery only have 1781 mAH after 139 charged cycle. If it's high capacity which is 2100mAh, it would still stay 2100mAh after 139 charged. This photo is our original battery which tested in the same way. It's 150 charged cycle and it still has 1802mAh. It's normal that battery is little more or less from 1750mAh, but 5% + or -. Update: Someone is selling this brand of battery contacted me, he said it's unfair to read this because of charge cycled condition. So i put up another photo of another original battery reading which conducted the same test and charged cycled. an original Baseus Battery iPhone 7 on his way to my place.. let's do a full test see how it goes.